The front entryway to my home has an open arch with a non-working window high off the ground. We have had a problem with birds entering the entryway through the archway but getting confused and trying to exit through the upper window. This has resulted in my having to do several bird rescues once the birds became too tired to resist my getting close to them. To avoid this problem, my wife and I came up with the idea of putting seasonal leaded windows in the entryway. Hopefully the birds would find the exit as easily as they found the entrance. 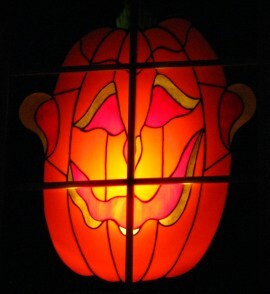 The jack o'lantern is the first seasonal window I have built and installed. 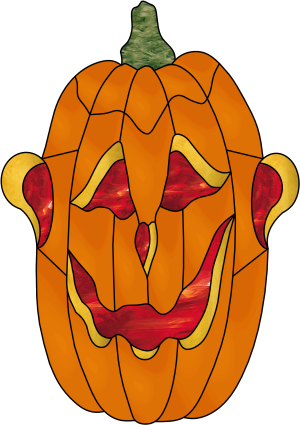 I searched the internet for jack o'lantern designs and found plenty of "cute" designs. However, I wanted something a little more imposing and the design needed to fill a 21" x 33" space. 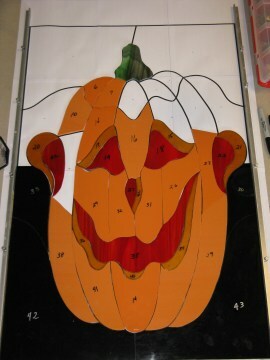 My plan was to start with a normal jack o'lantern pattern and then to manipulate it to fit my needs. Luckily, Glass Eye 2000 has a "Stretch" command. I had never used this command before but soon learned it was the solution to my design problem. I started my design with a standard jack o'lantern. I then did a "Select All" from the Edit menu, and then selected "Stretch" from the Modify menu. (I have since learned that I could have used the "Stretch All" command and eliminated the "Select All" step.) The "Stretch" command allowed me to lengthen and widen the basic jack o'lantern design until it fit the required space and displayed a little eerie attitude. Next, I wanted ears on the stretched pumpkin, so I drew some oblong shapes where the ears should be. Then I added knots to the ear lines which allowed me to pull the lines into a shape that I thought complemented the overall design. This project's toughest glass cut involved the mouth. Because I wanted it as a single piece and there were several convex and concave edges, I had to work the cuts very carefully. I used Spectrum #3571S for all the red areas including the mouth. The glass proved to be easy to cut and shape, making the curved lines flow very nicely. 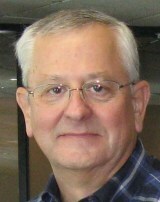 Ralph began his glass training by taking a foiling class in 2001 and then a lead came class in 2002. Ralph began using Glass Eye 2000 in 2004 and since then has been able to improve his skills by designing and making pieces for family and friends. He has enjoyed helping them unlock their imaginations and dream up designs using colors that they never imagined existed. His favorite design themes are focused on nature and its beauty, but he has also made pieces using prepackaged bevels. Ralph has completed projects involving flowers, animals and star formations photographed by the Hubble telescope. Ralph enjoys working on large-scale projects because they allow him greater opportunity to display nature while being creative with a huge array of glass colors and textures. You can contact Ralph via email.